Native to southern and eastern Africa where its uses are widely appreciated, African wormwood is characterized by its aromatic feathery grey-green foilage. It is reportedly good for treatment against fevers, malaria, bronchial diseases, coughs, colds, dyspepsia, stomach ache, gout, and constipation. 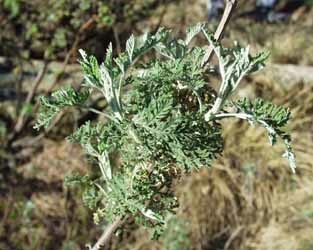 Similar to other wormwood varieties, it has a bitter taste. Externally, it is known to clear up skin infections and is a natural insecticide. Plant in full sun, and resist over watering. Prefers light to medium, fertile soil. Ht 2-3 ft.